MISSION, KS--(Marketwire - April 5, 2010) - (Family Features) Stretching food dollars to put healthy, delicious food on the table can be tricky. Registered dietician, nutritionist and author Elizabeth Somer has created these tips and budget-friendly recipes to help you add a healthy spin and big flavor to your meals without taking a big toll on your budget. Compare unit price. Often buying in bulk or larger sizes is more economical, but not always. Plan your meals in advance and keep a copy on the fridge and with you when you head to the grocery store so you're not trying to figure out what's for dinner while you shop. Make one evening a week the "no-cook night" where the entire family can join in to make wraps, pinwheels or another cold favorite. Take an inventory of what you have on hand. Keeping track of staples will keep you from buying food you don't need. Check the circulars. Seeing what's on sale will help you see what to stock up on and help with meal planning. These valued-focused recipes, created to serve five for around $10 or less, are easy to make and use simple ingredients for quick and satisfying family meals. Visit missionmenus.com to get additional recipes and tips. 1. Preheat oven to 425°F. 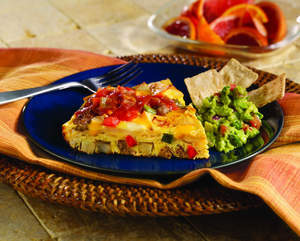 In large bowl, whisk together eggs, milk, chopped tortilla squares and chipotle pepper. Let stand for 10 to 15 minutes. 2. Heat oil in 12-inch heavy, oven safe non-stick skillet over medium high heat. Add diced sausage, potatoes, onions and peppers. Sauté mixture until tender, about 8 minutes. Season with salt and pepper to taste. 3. Spray skillet with vegetable cooking spray. Pour egg mixture into skillet; stir to cover potatoes, vegetables and sausage. Transfer skillet to oven and bake until the frittata is set (the eggs should be just firm and starting to puff up), 10 to 15 minutes. Remove skillet from oven, spread salsa evenly on top, and then sprinkle with cheese. Preheat broiler, return frittata to the top rack, about 6 inches from the heat, and cook until cheese is melted, about 1 minute. 4. Allow frittata to sit for about 3 to 5 minutes to firm up. Run a spatula along sides and bottom to loosen. Slide to a cutting board or large flat plate. Cut into 8 wedges, sprinkle with sliced green onions. Serve warm or at room temperature. 1. Preheat the oven to 450°F. In small bowl, mix together canola oil and ground chipotle pepper. 2. Mix all ingredients (except tortillas and canola oil and ground chipotle pepper mixture) in medium saucepan. Heat over medium heat until hot. Remove from heat. 3. Place 3 tablespoons chicken filling along edge of a tortilla. Roll tortilla up tightly. Put a toothpick through the middle to hold in place. Place on a large baking sheet sprayed with vegetable cooking spray. Repeat with remaining tortillas. 4. Lightly brush flautas with oil mixture. Bake until golden brown, about 15 minutes. Cool. Remove toothpicks. Transfer to platter, sprinkle with chopped fresh cilantro, serve with sour cream and salsa. 1. Mix chicken, black beans, salsa, cilantro, chipotle pepper and honey in large sauce pan. Heat over medium heat until hot. Remove from heat. 2. Heat large skillet over medium heat, and spray with vegetable cooking spray. Place one tortilla flat on skillet. After a minute, flip tortilla over. 3. Carefully spread about 1/2 cup chicken mixture on top of tortilla to the edges. Sprinkle with 1/4 cup cheese. Place another tortilla on top, press down with a spatula. Cover quesadilla with a lid. After 1 minute, if brown, flip quesadilla. Once cheese has melted, remove quesadilla, transfer to cutting board and cut into 8 wedges. Repeat for remaining quesadillas. 4. Place quesadillas on a serving tray, sprinkle shredded lettuce, diced tomatoes and chopped cilantro. Serve with sour cream and salsa.